Michael Haneke (left) on the set with Emmanuelle Riva and Jean-Louis Trintignant. Michael Haneke’s films are like sunburns: their sting doesn't set in until the next day. In his latest film, Amour, Anne and Georges (Emmanuelle Riva and Jean-Louis Trintignant) are a privileged, educated Parisian couple dealing the grim equalizer of old age. Haneke spares us none of the tedium and horror of their final days, measured out in spoon after increasingly bitter spoon. Driving home from the theater, my companion and I were silent. The next day, we could talk about nothing else. In this aspect, Haneke’s films resemble those of Alfred Hitchcock, imparting a long afterglow. For years, I’ve maintained that Haneke is the artistic heir to Hitchcock, and each new movie confirms it. Their artistic sensibilities are almost identical. Haneke once declared that “the principal theme of all my films” is the question of “What is reality in cinema?” Hitchcock raises the same question. Haneke is no mere dime-a-dozen “Hitchcockian” director. (I'm looking at you, Brian De Palma.) Just as Hitch stood on the shoulders of F. W. Murnau and D.W. Griffith while contributing his ideas and voice to cinema, Haneke stands on the shoulders of Hitchcock. He's an auteur in the old school tradition, and it’s that mastery of his medium, coupled with his singleness of vision, that places him in Hitch’s league. It's a sense of tradition. Like Hitch, he deals in the big questions of the human condition, which, it turns out, are also the most urgent and intimate. What is love? What is loyalty? What is sin? What is the next loving/loyal/unsinful thing to do? In his universe (as well as in Hitch's), the answer to that question is never simple. Amour demonstrates that the next right act can be as horrific as anything Hitchcock showed us. And then he takes it one step further: while Hitch’s films invite self-reflection, showing us the way to forgiveness (or at least cutting our enemies a little slack in the larger scheme), Haneke’s films scrape down to the next level, causing you to wonder whether you’re up to the task. While Hitch’s films invite self-reflection, Haneke’s films go one step further, scraping down to the next level, causing you to wonder whether you’re up to the task. With Hidden (French: Caché), he explored the Hitchcockian theme of shared guilt and our collective complicity, not just in sin itself, but in the shared costs its cover-up measures out to our selves, our families and society. Not since Topaz, perhaps, has the subject been mined so ruthlessly. I wrote a bit about the film here. Amour is stripped of any suspense. Its opening scene gives us Anne laid out on her deathbed, now a makeshift a funeral bier. The rest of the film is about what comes before. But even without that, as her mental and physical functions disperse one by one, even a child would know how this movie ends. The film shackles us to the couple, forcing us to join them in the here and now—which is all we’ve got, anyway; and if the film has a moral, it’s this cold comfort of pop philosophy. Hitchcock often bristled at the constraints the title Master of Suspense imposed on him. Given time, I can see him making a thriller like this. The claustrophobic single settings of Lifeboat, Rope, Dial M for Murder and the final act of The Birds suggest that the trappings of domesticity, not to mention wealth, are indeed a trap and that those who allow themselves to be thus caught can only escape by facing harsh judgment or death (or both). Haneke seems to have picked up on and continued that message. Like Dial M for Murder—another movie about domestic homicide—Amour takes place almost entirely inside the couple’s elegant apartment. Unlike her globetrotting, concert-performing students, Anne, a piano teacher to elite students, has evidently spent her lifetime ensconced in these rooms, watching and instructing, but never fully doing. If Schubert's piano works—i.e. chamber pieces—ever provided any comfort for their souls (a tenuous assumption, if Haneke's earlier The Piano Teacher has anything to say about it), they are now only a reminder of their ineluctability of their destiny. Just about every wall of their home is packed floor-to-ceiling with books and art and curios accumulated over the years. I found my eyes wandering to the bookcases to peruse their titles, only to discover that most of them had indecipherable, if not blank bindings, as if at this stage of the game, all of their literature and learning will be useless for dealing with such situations as when Anne wakes up to find herself soaked in her own urine. Even in their dreams, there's no escaping this place. Haneke's earlier films also hint at what Norman Bates characterized as "private traps." For example, inside a posh lakeside mansion, the well-to-do family of Funny Games is tormented by a pair of demoniac teenagers who seem to have no more motive for killing than do Rope’s Brandon and Phillip—unless you consider complacency to be a punishable offense, a point on which both Hitch and Haneke would agree. Behind the simplicity of Haneke's storylines and technique—excruciatingly long takes with a stationary, unblinking camera—lies a subtle mind that has thought through the meaning of his stories and the medium in which he tells them, clear to their difficult, often abhorrent, end. At one point, Georges slaps Anne in the face, and we are not spared the force of it through clever editing or stagecraft: we watch her face implode under the weight of his hand. He immediately realizes that he’s gone too far and, with a murmured apology, retreats from the room. The camera, too, cuts away, as if in shame, to rest on a series of paintings hanging on their bedroom wall. I’m reminded of the long take in Frenzy, which spares us the details of unspeakable violence happening in an upstairs flat as the camera backs discreetly away and out to the street. To love another is to forfeit all defenses against suffering—yours and theirs. Hitchcock offers little and Haneke offers even less in the way of comfort. Neither director was ever comfortable with the bland reassurances of the Hollywood ending. In place of mere optimism, they offer us wisdom. And with wisdom comes hope. If you're lucky, you'll share your last days with someone who will do for you what you can't do for yourself, even if it's the imparting of oblivion. That, too, is amore. 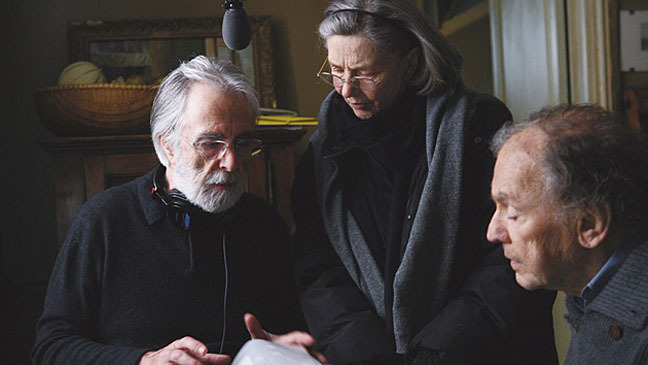 Congratulations to Michael Haneke for taking home a 2013 Oscar for Amour in the Best Foreign Film category. I haven't see "Amour" yet, but you're connection to with it with the alienation and moral culpability of everyday people. I can't help thinking of the story of "Amour" in contrast to Vera Miles breakdown in "The Wrong Man" and Henry Fonda's character Manny's helplessness in the face of total paranoia and the loss of his wife. Molly Haskell's remark that the happy ending of that film was probably not what Hitchcock wanted to use but one he bowed to to please the sensibilities of the studio. The themes of "Amour" do not sound comforting, but no film about the raw facts of life ever does, don't you think? Thanks for another great essay Joel. Hey Doug, I hadn't thought of THE WRONG MAN, but that definitely prefigures Haneke in a lot of ways. Thanks much, sir! I have yet not seen anything by Haneke, but I had heard Cache called "Hitchcockian" and wanted to see it. Reading your blog definitely made me want to hunt it down, as well as Amour. Awesome, Hannah, take a look at them and let me know what you think! Haneke is like a new Bergman/Bresson. Problem is he's boring and obvious. Hey Andrea... Interesting comparison. I wouldn't have made that connection, but you now have me thinking. Which is good. Sorry, I don’t agree at all. I don’t want to get into each of your claims of resemblance. But Hitchcock entertained with suspense-stories, focussed on strong visual storytelling. Haneke often educates, through his well-directed actors. I really don’t see much resemblance and it’s tiring to keep hearing this or that director is « the new Hitchcock ». Let’s just appreciate each director for his own qualities. fair enough, Jochen - thanks for dropping by!